Just when you thought that the "ugly" sandal trend couldn't get any, well, uglier, along comes Christopher Kane's S/S 17 show, for which he had his models wear Crocs. While we've fully embraced Birkenstocks and hiking sandals, this is one step that could prove tough for even the hardiest of fashion girls… Or are we too quick to dismiss the idea? Stranger things have happened, after all. During day four of London Fashion Week, Kane sent his models down the runway wearing an array of coloured and bejewelled Crocs. Some wore light-brown versions featuring pastel-hued crystals, while others had marbled Crocs, also dotted with mini jewels. Raised eyebrows all round, indeed—and social media went wild. There's no question over comfort or practicality here, but could the Croc effect catch on in high-fashion circles? Seeing as it's Christopher Kane—and he's a total genius who we trust implicitly—don't be surprised if every cool girl starts hopping aboard the new sensible shoe trend ASAP. Keep scrolling to take a look at the shoes and how they're being styled on the runway. 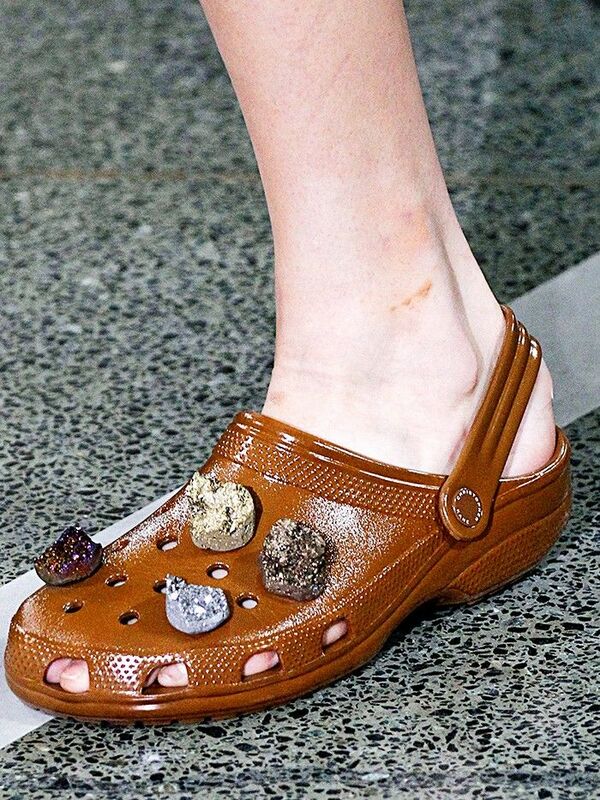 The brown Crocs and the crystals. Will you give it a go? A pair of blue Crocs styled with metallic pleats. Those marbled Crocs with a bit of lace. Tempted to try out a pair of Crocs? We suggest shopping the classic range first to ease yourself in.